I’ve been catching up on some of my favourite blogs today and a post by Linda from Adventures in Expatland has inspired me to put some thoughts on paper – or fingers to keyboard if that’s your fancy. Linda is an expat like myself but she is an American living in Holland and just recently she posted on another expat site Expatria Baby, about cultural differences. You may be wondering at this point why a post on cultural differences has inspired today’s theme on Gidday. After all, I am an expat and consider myself to be a well-travelled kind of gal. But you see, Linda wrote about integrating into the Dutch culture and me, being half-Dutch, was nodding away through the whole piece, muttering ‘oh yes’, ‘absolutely’ and ‘of course!’. And it got me thinking: why do I identify so strongly with this part of my heritage having never lived there? First, let me create a bit of context. Dad is the Dutch one. Born in Amsterdam, he emigrated to Australia with his parents and older sister when he was seven years old. He married my Australian Mum (her lineage is English/Irish a couple of generations back but that’s a whole other story) in 1969, the same year I was born. We lived two suburbs away from Oma and Opa until I was nine years old. We never spoke Dutch at home. While we never learnt to speak the language, Oma and Opa taught us nursery rhymes in Dutch, (Klaps Eens In Je Handjes was a particular fave) and we all toasted special occasions with ‘Prosit!’ so the cadence of the language surrounded our early childhood. 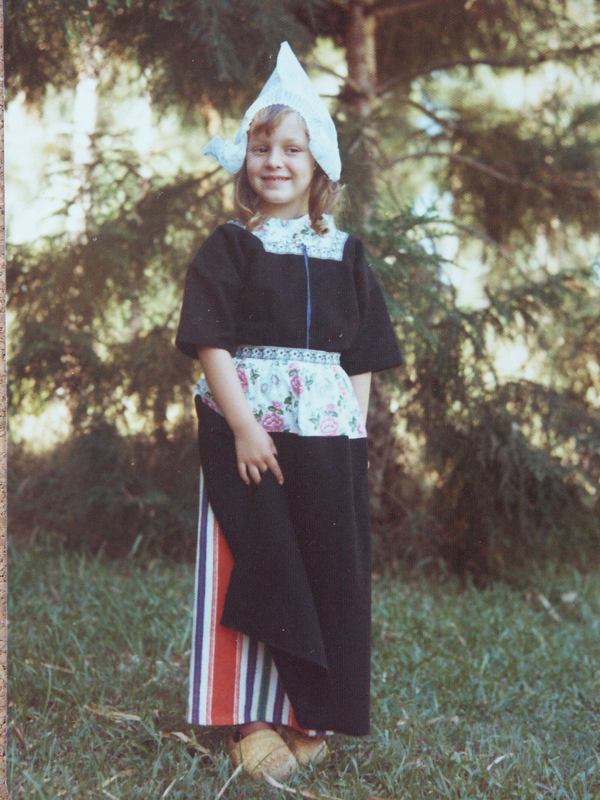 There was even an ‘authentic’ Dutch costume that was passed down from me to Lil Chicky and we still have the clogs despite growing out of them ‘several’ years ago. Fast Forward – I first visited Holland (Amsterdam in fact) in 2000 at the age of 31. I have been back twice since: once to wander around Amsterdam on my own for four days in October 2008 and again just a few months ago for work, I visited Den Bosch. It felt comfortable and sounded like my childhood – no huge surprise there. All part of a culture that believes strongly in a Calvinistic sense of personal responsibility. The door is there, of course one should be prepared to open it. But there’s more: apparently I have a Dutch ‘look’ and a Dutch nose ‘to look down’ (although Mum, I don’t think it looks particularly Dutch, or any nationality really). And to top it all off, a guy I was absolutely smitten with when I was 19, remarked to Mum in the early stages of our relationship that I was very pragmatic. This may have been true (and in fact, quite insightful) but my tender and romantic teenage heart was crushed. So in between my ‘get off your a***’-ness’, ‘give me space’-ness and ‘I am fond of you’ effusiveness, there’s a romantic soul who believes in life’s ‘journey’, an idealist who always looks for the best in others and a friendly Aussie lass who thinks a passing exchange of greetings in the street makes the world a nicer place. There are plenty of times when these two opposing forces vie for attention – my desire to believe it will all turn out for the best constantly confronted by the voice saying that if I don’t make it happen, it won’t. So how do I manage this dichotomy I hear you ask? Well let me tell you, I am a whizz at delivering tough news – direct as you like – with a smile. And if you happen to provide below par service to this particular customer, don’t object in the face of my refusal to pay the service charge. This entry was posted in All About Me, The Australian Way and tagged blogging women, Going Dutch by Kym Hamer. Bookmark the permalink. I'm thinking 'the look' is a genetic mom/mum-thing, regardless of cultural background. Mine didn't flash it often, but boy you didn't mess around once you saw it! Yes Mum come to think of it the Dutch look cannot compete with the stillness of a Mother's calm and quiet wrath. Nothing to do with nationality there. Every child the world over will know this – a truth we hold self-evident and only hope to gain mastery of at some point in our grown up lives. For the interested: I have always believed that “Looking down their Dutch noses” was a trait in my daughters inherited from their Dad. However, those same daughters constantly remind me that they were okay with the noisy tirade I could deliver if they misbehaved, it was the silent “look that could still a room” that made them want to find a place to hide. I have no Dutch heritage so I guess the former behaviour comes from my Irish roots which leaves the latter, somewhere among my English/Australian heritage? It is, after all, a small, small world. Linda, the look is a scary thing – so I'm told! This post proved a real winner with Lil Chicky who I cannot remember ever being credited with 'the look' by Mum but who did have the nickname at High School of 'Sledge' – as in sledgehammer, a lovely play on the mis-pronunciation of our one-M-ed surname! Thanks to both of you for your thoughts. Mwah, mwah, mwah! Thank you, what a nice surprise, and even better to read. I love how your family kept your Dutch roots alive and flourishing despite being halfway around the world. The questions of nature vs. nurture, and where your Aussie side ends and your Dutch side begins are so interesting. I really enjoyed seeing where you went with this piece. And I definitely don't ever want to see… the look! Oh so very true! It has always amazed me that the Dutch have their own undiluted cultural identity despite being surrounded by other nationalities. I can only put it down to them having upset so many with their bluntness and pragmatism they've been left alone to get on with it! !